America’s favorite past time wouldn’t be the same without peanuts, a hot dog, and an ice cold BEER. From tailgate parties, March Madness, the Superbowl, frat parties, to even Spring Break, it all adds up to millions of barrels of American-style lager being consumed every year. Although the microbrewery boom over the past quarter of a century has tried to shine a negative image on this beer, the lager is still the best selling beverage in America. It’s cheap, it’s refreshing, and it’s sold in every bar, restaurant, and grocery store from coast to coast. 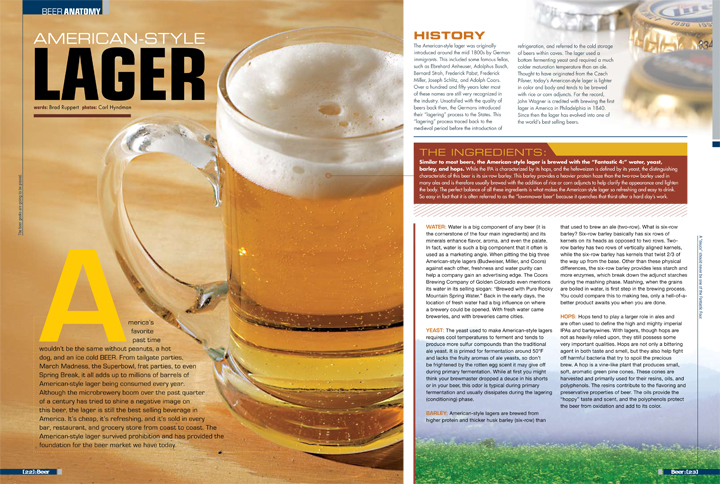 The American-style lager survived prohibition and has provided the foundation for the beer market we have today. The American-style lager was originally introduced around the mid 1800s by German immigrants. This included some famous fellas, such as Ebrehard Anheuser, Adolphus Busch, Bernard Stroh, Frederick Pabst, Frederick Miller, Joseph Schlitz, and Adolph Coors. Over a hundred and fifty years later most of these names are still very recognized in the industry. Unsatisfied with the quality of beers back then, the Germans introduced their “lagering” process to the States. This “lagering” process traced back to the medieval period before the introduction of refrigeration, and referred to the cold storage of beers within caves. The lager used a bottom fermenting yeast and required a much colder maturation temperature than an ale. Thought to have originated from the Czech Pilsner, today’s American-style lager is lighter in color and body and tends to be brewed with rice or corn adjuncts. 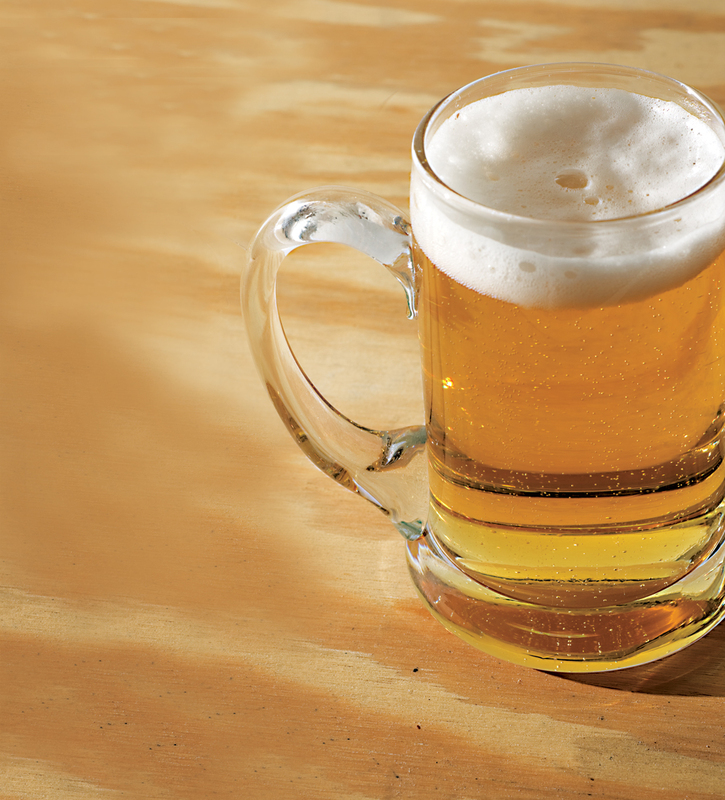 For the record, John Wagner is credited with brewing the first lager in America in Philadelphia in 1840. Since then the lager has evolved into one of the world’s best selling beers. Similar to most beers, the American-style lager is brewed with the “Fantastic 4:” water, yeast, barley, and hops. While the IPA is characterized by its hops, and the hefeweizen is defined by its yeast, the distinguishing characteristic of this beer is its six-row barley. This barley provides a heavier protein haze than the two-row barley used in many ales and is therefore usually brewed with the addition of rice or corn adjuncts to help clarify the appearance and lighten the body. The perfect balance of all these ingredients is what makes the American-style lager so refreshing and easy to drink. So easy in fact that it is often referred to as the “lawnmower beer” because it quenches that thirst after a hard day’s work. Water: Water is a big component of any beer (it is the cornerstone of the four main ingredients) and its minerals enhance flavor, aroma, and even the palate. In fact, water is such a big component that it often is used as a marketing angle. 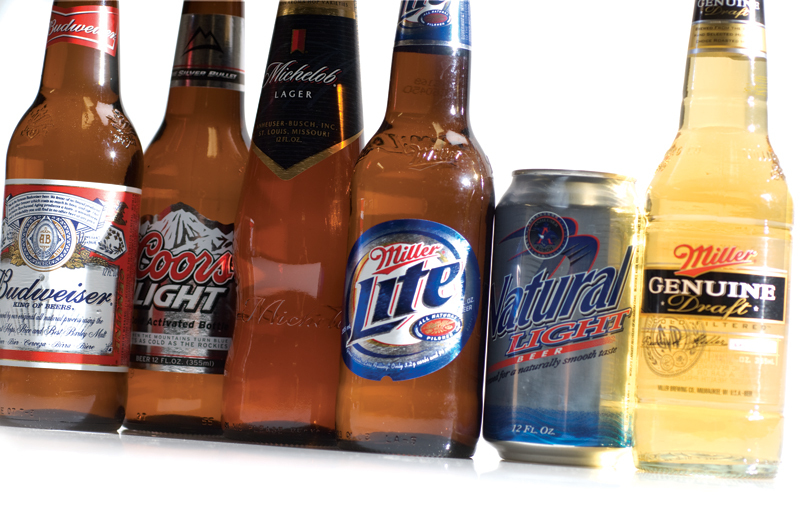 When pitting the big three American-style lagers (Budweiser, Miller, and Coors) against each other, freshness and water purity can help a company gain an advertising edge. The Coors Brewing Company of Golden Colorado even mentions its water in its selling slogan: “Brewed with Pure Rocky Mountain Spring Water.” Back in the early days, the location of fresh water had a big influence on where a brewery could be opened. With fresh water came breweries, and with breweries came cities. Yeast: The yeast used to make American-style lagers requires cool temperatures to ferment and tends to produce more sulfur compounds than the traditional ale yeast. It is primed for fermentation around 50°F and lacks the fruity aromas of ale yeasts, so don’t be frightened by the rotten egg scent it may give off during primary fermentation. While at first you might think your brewmaster dropped a deuce in his shorts or in your beer, this odor is typical during primary fermentation and usually dissipates during the lagering (conditioning) phase. Barley: American-style lagers are brewed from higher protein and thicker husk barley (six-row) than that used to brew an ale (two-row). What is six-row barley? Six-row barley basically has six rows of kernels on its heads as opposed to two rows. Two-row barley has two rows of vertically aligned kernels, while the six-row barley has kernels that twist 2/3 of the way up from the base. Other than these physical differences, the six-row barley provides less starch and more enzymes, which break down the adjunct starches during the mashing phase. Mashing, when the grains are boiled in water, is first step in the brewing process. You could compare this to making tea, only a hell-of-a-better product awaits you when you are done. Hops: Hops tend to play a larger role in ales and are often used to define the high and mighty imperial IPAs and barleywines. With lagers, though hops are not as heavily relied upon, they still possess some very important qualities. Hops are not only a bittering agent in both taste and smell, but they also help fight off harmful bacteria that try to spoil the precious brew. A hop is a vine-like plant that produces small, soft, aromatic green pine cones. These cones are harvested and primarily used for their resins, oils, and polyphenols. The resins contribute to the flavoring and preservative properties of beer. 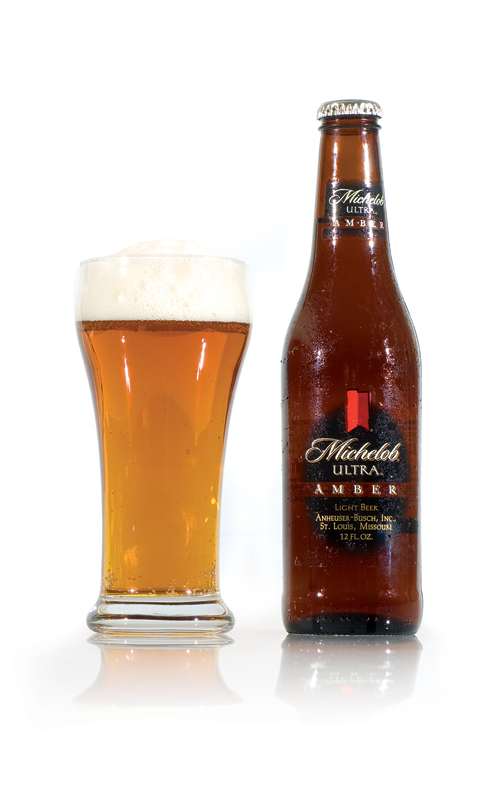 The oils provide the “hoppy” taste and scent, and the polyphenols protect the beer from oxidation and add to its color. 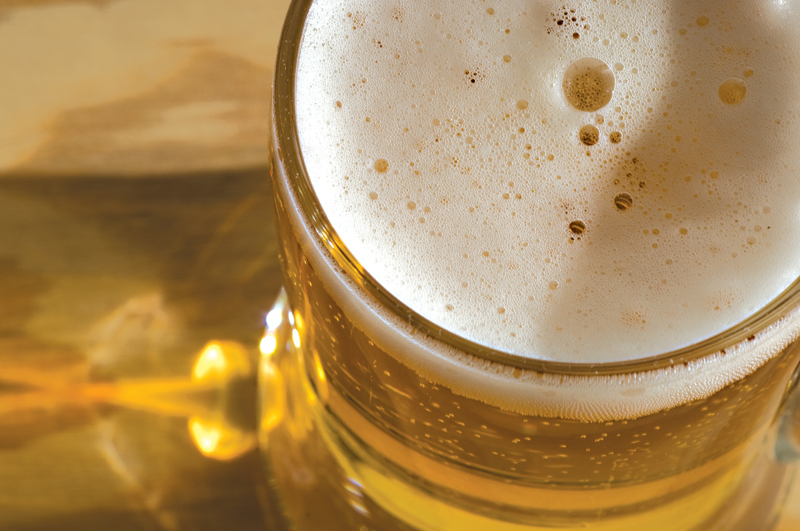 Brewing an American-style lager requires time, cold temperatures, and the right yeast. While the primary fermentation of an ale may only take two to five days, a lager may require one to three weeks. Why so long? The yeast requires a lower temperature to begin the fermentation process, the consumption of soluble sugars to produce alcohol and carbon dioxide. This lower temperature slows down the molecules and the rate at which they interact. Let’s take an example of warm weather versus cold weather. When you picture girls in bikinis at the beach, you see them jumping about playing volleyball, oil wrestling, or tossing around the Frisbee. Now take those same girls and picture them in Chicago in January. They’d be bundled up from head to toe and walking about half a mile an hour. Well, molecules are the same. Colder temperatures help prevent the development of fruity esters from the yeast as well as other unwanted byproducts. There are three types of American-style lagers: American Lager, American-style Light Lager, and American-style Low-Carbohydrate Light Lager. 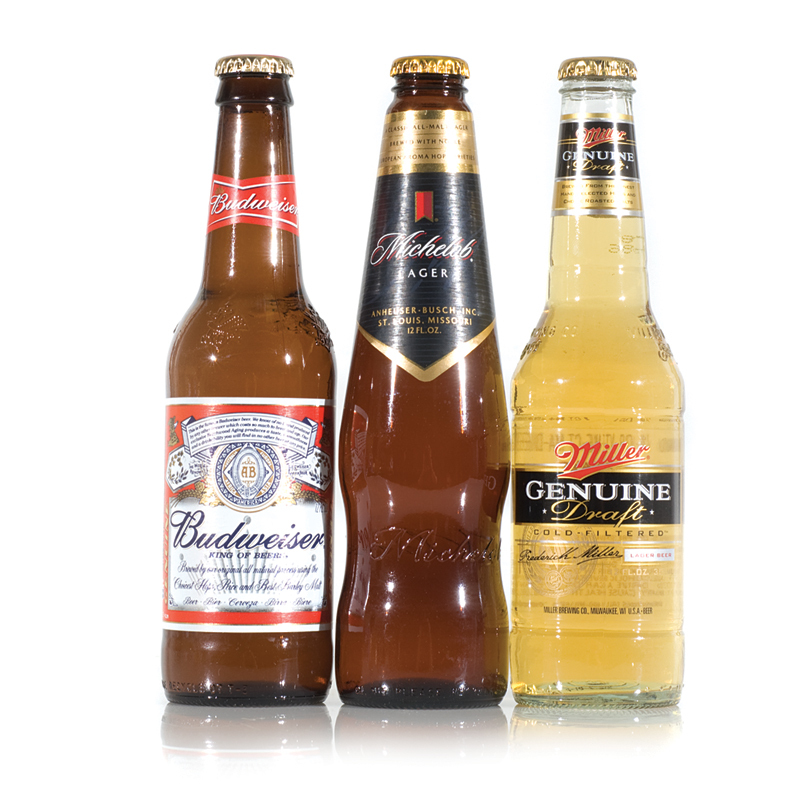 Each of the three beers is somewhat similar in appearance but quite different in taste, body, and mouth-feel. The American Lager could be classified as the heaviest of the three, with a slightly darker color, thicker taste, and the most calories. 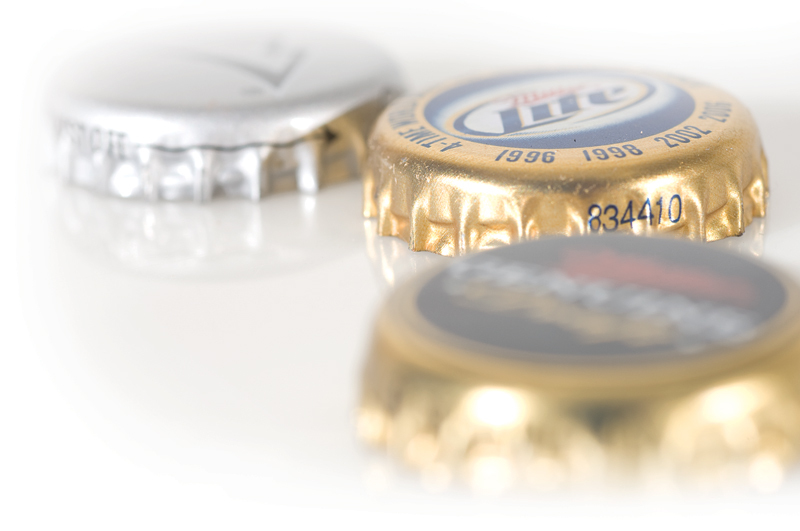 The light beer was introduced by Miller Brewing in the mid 70s as a popular alternative to the American lager; the idea was that you could drink more without getting filled up. Light lager was popularized by many athletes and sports heroes in commercials along with the memorable campaign “Great Taste vs. Less Filling.” The commercials of the 80s featured a few guys, which usually erupted into crowds of dudes yelling at each other in a football stadium, arguing back and forth about why they drink light beer. Budweiser quickly jumped on the “light” bandwagon and started a catchy campaign of “Give me a Light…. No Bud Light.” There were some crazy commercials about bartenders giving customers some overly elaborate lights (flame thrower, torch) instead of beer. Coors even joined in with their silver Coors Light cans and the slogan, “Silver Bullet. It won’t slow you down.” I’m sure you can find these on youtube.com if you care to take a trek down memory lane. The low-carbohydrate beers have only emerged within the last several years and are even lighter versions of the “Light Beer.” These beers are lighter in calories, alcohol, and carbohydrates and are marketed toward people who want a healthy beer. If you could figure out a way to make a high alcohol, fat-burning beer, you’d either be a millionaire or Dr. Kevorkian. At first glance this beer is vibrantly straw-colored, translucent, and quite bubbly. There is little to no haziness in this beer and it should appear quite clean and refreshing. You’ll notice that this beer is quite thin compared to a stout or porter. The head is brilliantly white and quite tall, but soon dissipates. The carbonation is often very apparent as the bubbles shoot from the bottom of the glass to the surface of the beer. When comparing the standard lager to the light or low-carb light beers, you’ll see noticeable differences in thickness and tone. It doesn’t take a genius to figure out that lighter beers are lighter in appearance and thickness. An overwhelmingly fresh barley scent stands out in these beers when compared to beers of other styles (ales, stouts, hefeweizens). Although there is a slight hoppy presence it is masked by the effervescence of the supple corn or rice-like aroma. There is little to no fruitiness and no traces of the floral smells you might find in an ale. With your eyes closed and your nose over one of these beers you’ll think you are standing in the wheat fields overlooking vast fields of crops. The initial sensation on your palate is sparkly acidic due to the high carbonation, and is followed by a smooth bread-like flavoring. You’ll taste a mild hoppy and alcohol-like flavor with a sharp finish. The tastes are very dry and somewhat bitter, leaving a shallow malty aftertaste. Depending on the freshness of the beer, serving temperature, and the medium it’s delivered in (keg, bottle, can), the outcome can vary quite drastically. American-style lager served in a can tends to deliver a smooth buttery taste, while bottled beer delivers a mild sweetness. Draft beers tend to be the freshest because they are almost always kept cool from the day they are brewed to the day they are served. These beers tend to be highly carbonated both in the bottle and in the keg. High carbonation means an enormous head. Although some head is desired, more often than not these beers can easily end up with 90% head and about 10% beer. Whoops! If you’ve got a bottle and you choose to pour the beer into a glass, tilt the glass to a 45° angle and pour slowly. Only bring the glass upright toward the end of the pour, if at all. These beers will usually form a decent head even if left tilted the entire pour. If you’re pouring from a keg, good luck! The same rules about keeping your cup tilted apply, but most importantly, DON’T PUMP THE HELL OUT OF THE KEG. Nothing’s worse than waiting in line for 10 minutes at the keg only to get a cup full of foam. If your keg is shaken up or has too much pressure, either let some of the pressure out using the release valve, or get a pitcher to capture the foam-volcano and wait for it to turn to beer. Patience is a virtue. Otherwise, do what I do. Become the KEGMASTER! 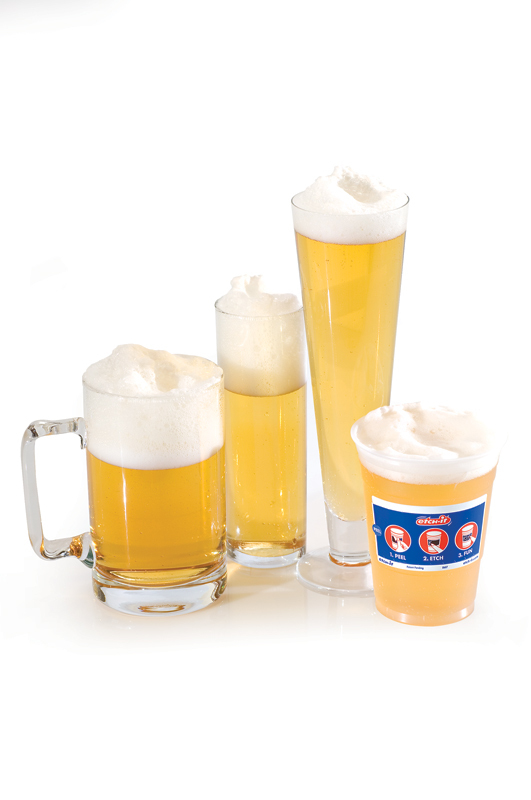 Offer to pour everyone else’s beer, giving all the foam to the idiot dudes crowding around you. Then when the foam goes away and the pure-beer come flowing out, fill yourself first and of course be certain to top off the occasional hottie’s beer as well. Glass: The American-style lager has to be the most versatile of any beer on the market when it comes to proper serving glassware. Location, environment, and event will all have an effect on the outcome of how the beer should be served. If you are in a bar, you might see it served in a pint glass if they have it on draft. Otherwise the beer is typically served in a bottle or even a can, if you’re lucky to find a joint “classy” enough to offer cans. If you are at a Superbowl party or BBQ, you would probably see your lager served in the ever-famous red plastic keg cup. If you are tailgating at a football or baseball game, you’d see it being shot-gunned from a can. Time of year can even play a big role in how lager is served. During Spring Break, for example, you’d likely see it housed in a beer bong, ready to be cannon-balled down. Temperature: Not only is this beer made at some of the coldest temperatures (compared to other beers), it should also be served the coldest. It is recommended that it be stored in the colder part of your refrigerator and kept around 32-39°F. This is just above freezing; be careful not to actually freeze your beer, else it will end up exploding all over the inside of your fridge. I’m sure everyone has endured that unfortunate accident at least once. Typical Scenario: Brought home a case of beer from the store and threw it in the freezer to speed up the cooling process. Forgot about the beer and woke to a mess in the freezer that looked like a bomb went off! Good times cleaning up that mess! One of the great things about the American-style lager is that it pairs well with a wide variety of foods. It goes well with all party foods including nachos, buffalo wings, spinach-artichoke dip, and especially pizza. 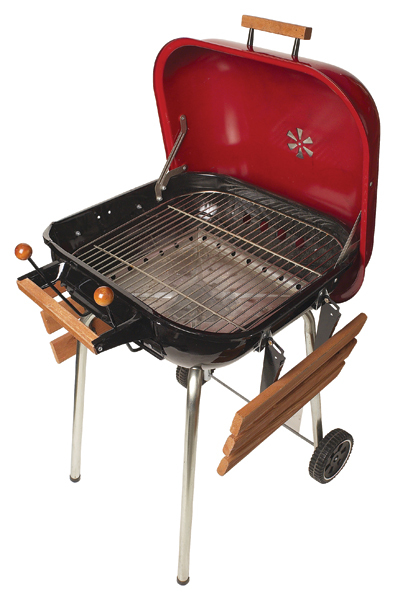 It goes great with BBQ chicken, ribs, hamburgers, and of course all-American hotdogs. If you pick up some fried chicken to take to the lake or a bag of tortilla/potato chips, this is your beer. When you think American food, the American-style lager is the perfect complement to it all.